Prior to analyzing the ongoing situation, I’ll begin with a short review of the legal regime of the waters under consideration. According to customary international law and the Law of the Sea Convention 1982 (“LOSC”) a coastal state maintains an inherent right to a continental shelf, which extends up to a distance of 200 nautical miles (“nm”) measured from the coast. In addition, a littoral state is also entitled to claim an EEZ of a breadth of 200nm. In these zones, the coastal state enjoys exclusive sovereign rights for the purpose of exploring and exploiting the natural resources, either living or non-living, in its seabed and subsoil (articles 58(1)(a), 77(1)(2) and 81). Consequently, no other state can set forth assertions over the natural resources in another state’s maritime zones. Nevertheless, in both the continental shelf and the EEZ the freedom of navigation shall not be hindered (articles 58(1) and 78) as those waters, in essence, form part of the high seas. This is a trade-off aiming at striking a balance between the viewpoints of the great maritime powers on the one hand (which were reluctant to concede expansion of state jurisdiction over the high seas) and the smaller states on the other hand (which sought extended maritime rights in order to safeguard the natural resources of their sea waters). The predicament in the waters surrounding Cyprus goes back to 2003 when Cyprus concluded an EEZ delimitation agreement with Egypt (Cyprus penned two more delineation agreements with Lebanon in 2007 -yet to be ratified- and Israel in 2010). Turkey holds a long-standing position according to which islands facing longer coastal fronts should have diminished rights in terms of generating maritime zones; as a result, Turkey does not recognize the rights of the Republic of Cyprus to a continental shelf and its capacity to claim an EEZ around the island. Further, the Turkish government argues that the breakaway regime in northern Cyprus, namely the self-proclaimed “Turkish Republic of Northern Cyprus” -a territory which has been occupied by the Turkish Armed Forces since 1974 and is deemed invalid by the UN Security Council (Resolutions 541/83 and 550/84) and the International Court of Justice (Kosovo Advisory Opinion 2010, para 81)- is eligible to lay claims with respect to the island’s underwater natural resources. 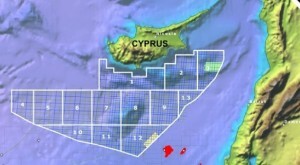 Turkey and the putative state in northern Cyprus granted oil concessions to TPAO (the Turkish national petroleum company) as regards the entire maritime space around Cyprus, in conflict with the Republic of Cyprus’ claim based on the LOSC and customary international law and despite the fact that the Turkish coasts do not project in some of the claimed sea areas. Moreover, Turkey concluded a continental shelf delimitation agreement with the secessionist entity in northern Cyprus and conducted seismic surveys in the western sector of the Republic of Cyprus’ EEZ purporting to create “grey zones” around the island. Against this backdrop, Turkey issued a NAVTEX notifying mariners that the government-controlled research vessel “Barbaros” will perform seismic surveys off the southern coast of Cyprus from October 20 to December 30, 2014 .Indeed, since October 20 the “Barbaros” has been sailing in the continental shelf and the EEZ of Cyprus in low speed (not exceeding 4.5-5 knots), a factor indicating that seismic research for the discovery of hydrocarbon reserves is taking place. Notwithstanding the freedom of navigation according to which the Cypriot authorities cannot hamper the “Barbaros” from traversing its waters, the conduct of research operations is in breach of both international law and the Cypriot legislation by virtue of which such unauthorized actions constitute criminal offences. Even though the LOSC stipulates that “States shall have due regard to the rights and duties … and shall comply with the laws and regulations” of the coastal state in the EEZ (art. 58(3) LOSC) the Convention remains silent as to the measures a littoral state is entitled to take in case its sovereign rights in the continental shelf and the EEZ are violated. Nonetheless, the International Law Commission back in 1956 considered the exercise of enforcement measures by the coastal state with a view to protecting its natural resources to fall within the scope of the “sovereign rights” notion (ILC Commentary 1956, p. 297); ergo, the Republic of Cyprus is authorized to implement its pertinent legislation on the members of the crew and the company owning “Barbaros”. Apart from any legal implications, the above-mentioned activities prompted the government of the Republic of Cyprus to withdraw from the UN-led negotiations for the solution of the Cyprus Problem (the occupation of northern Cyprus by the Turkish Armed Forces since 1974). Moreover, on October 24 the European Council condemned the foregoing illicit actions (European Council, Conclusions, para 24). Over the last few years, owing to its strained relations with Russia, the European Union (“EU”) has been seeking diversification of its energy sources; to this end, the EU is poised to support any of its member-states, which have the potential to become energy suppliers, Cyprus being one of them. Given the soaring needs for additional energy supplies, tensions over sea waters, where vast reserves of hydrocarbons lie, will inevitably be occurring. In the present case, the Turkish seismic surveys within the continental shelf and the EEZ of Cyprus are not in conformity with international law, namely the yardstick according to which interstate controversies should be dealt with. Also, the infringement of the Republic of Cyprus’ sovereign rights within its maritime zones poses a serious threat to security and stability in the region. A more rigorous response by the international community is required so as to thwarting further entrenchment of such illegitimate actions that, inter alia, impede Cyprus from exercising its inalienable sovereign rights over its natural resources; put at stake the aspirations of the EU to diversify its energy sources; and set dangerous precedents as these actions might be contemplated as a new form of intervention in contravention of article 2(4) UN Charter.